Lionel Messi returned to Barcelona from international duty with Argentina this week and skipped the club's only training session on Thursday to attend the birth of his son Mateo. But even the world's best player doesn't go straight back into the starting XI without training. So when Barça kicked off Saturday's big La Liga showdown at Atletico Madrid, Messi began the game watching from the bench. Judging by Messi's expression, he wasn't thrilled. 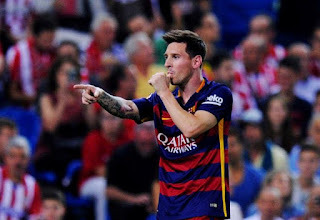 But Little Leo came on as a substitute in the 60th minute and, as has been the case for most of his encounters with Atletico Madrid, he scored – the 20th goal of his career against Atleti – finishing a nifty combination play in the 77th minute to cap Barcelona's comeback for a 2-1 victory. Messi marked the occasion by doing the requisite thumb-sucking celebration to honor his baby boy. Remarkably, he entered the day having gone goalless in his first two La Liga matches like his Real Madrid rival Cristiano Ronaldo. Ronaldo took care of his "goal drought" in impressive fashion with a five-goal explosion in a 6-0 destruction of Espanyol. Overshadowed by Messi's heroics was the brilliant free kick by Neymar that brought Barcelona level at 1-1. Four minutes after Fernando Torres gave Atleti the lead, the Brazilian produced this thing of beauty [Source : Yahoo Sport]. Lionel Messi returned to Barcelona from international duty with Argentina this week and skipped the club's only training session on Thursday to attend the birth of his son Mateo. Nice magazine blogger template i ever seen.